Nestled deep in the Santa Cruz mountains, down some twisty roads, is my favorite local state park: Portola Redwoods. 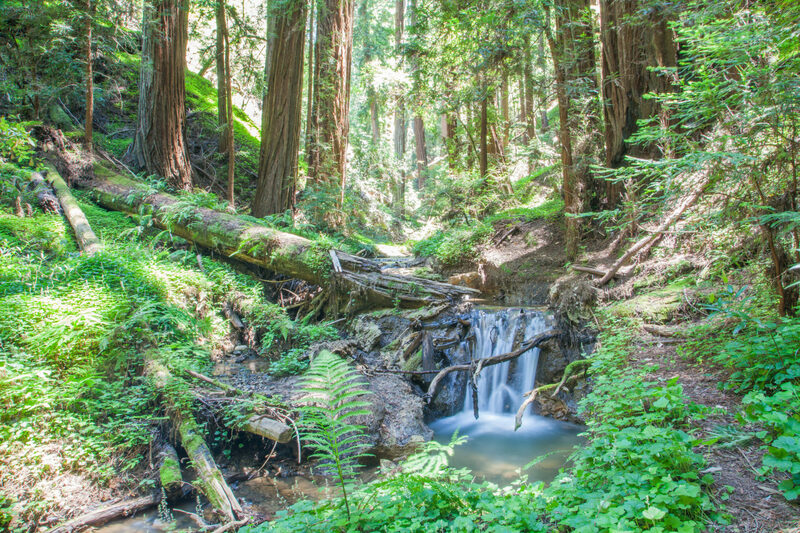 Creeks, short waterfalls and old growth redwoods are tucked inside this lesser traveled park. 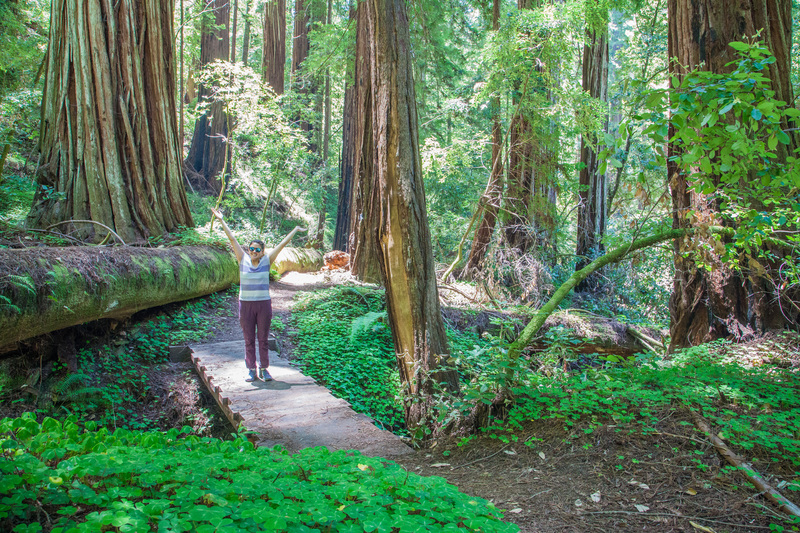 The trees aren’t as large as the ones found in nearby Big Basin State Park, but more often than not, you’ll find them in solitude. Weekend obligations kept me in the Bay Area a few weeks ago so I popped over to this park for a bit of solo hiking and mileage in preparation for long missions this summer. 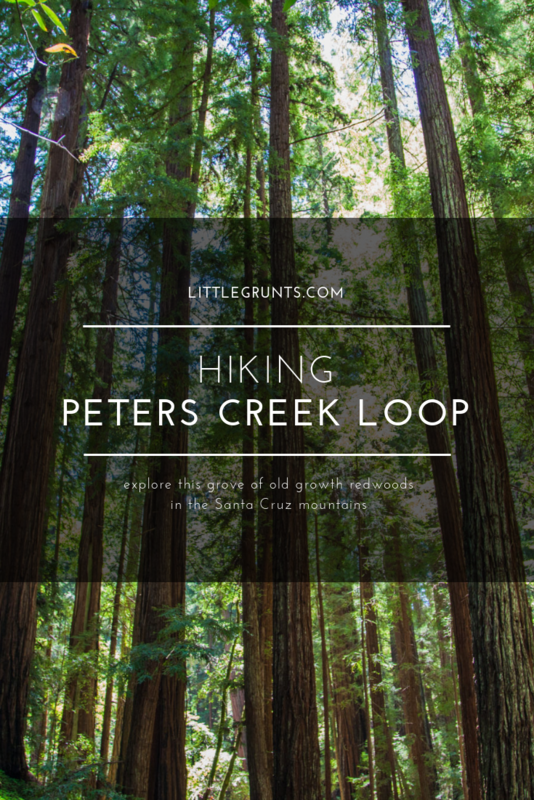 I hiked an old favorite: Peters Creek Loop. Two trailheads feed into the loop: Slate Creek or Summit. 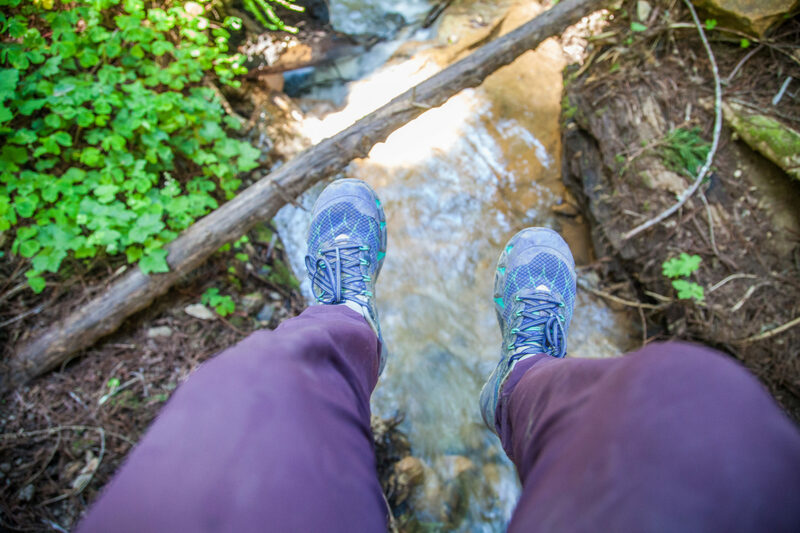 The Peters Creek Loop can be hiked as a lollipop, beginning from either trailhead, or as a figure eight, beginning at one and finishing on the other. At time of hike, Slate Creek Trail was “closed” before the intersection with Summit due to downed trees. However, the ranger I spoke to at the station said that it was passable. 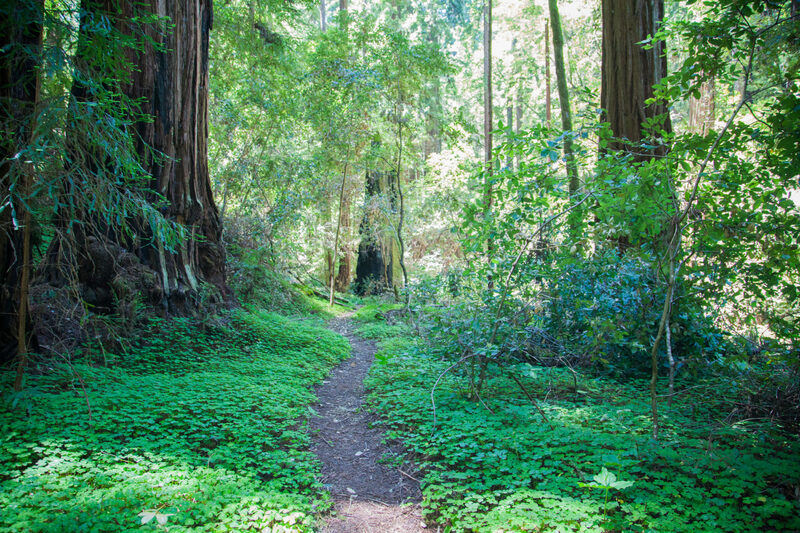 Because Portola Redwoods is a less traveled park, the bare minimum goes into maintaining the trails. The well groomed trails are closest to park headquarters. Beyond that, they’re overgrown with downed trees. I took Summit Trail to Peters Creek as a lollipop because I wanted to pop down to Tiptoe Falls on my way back to the car. Summit Trail begins off a paved (boo, I know) road to the right of the main parking lot. There are sections of trail that travel alongside the road, but they are quite overgrown, unmaintained, and gain and lose a bit of elevation. The road steadily climbs up until Summit Trail splits off on the left. From Summit Trail, you pass two water towers before beginning steep switchbacks up. Follow the trail until it meets up with Slate Creek Trail. At the junction of Summit and Slate Creek, take a right towards Slate Creek Trail Camp. A left will bring you back to park headquarters. Slate Creek to Trail Camp is a relatively flat and short stretch of trail. Before you know it, you’ll see the backcountry outhouse. To the left, the trail turns into Bear Creek Trail, which leads you to the Peters Creek Loop. There’s a sign that warns hikers of a strenuous trip, and rightfully so. You lose a good amount of elevation heading into the old growth forest and need to gain it all back on the way out. 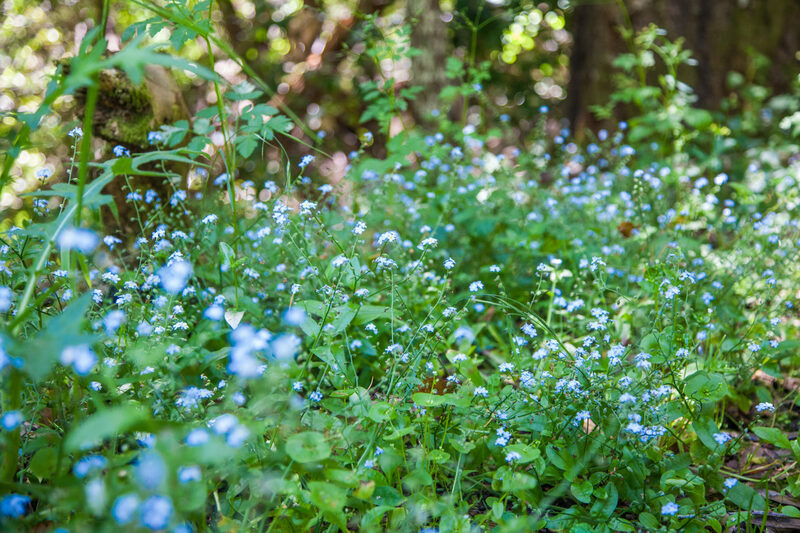 With all of the winter rains we’ve had, Bear Creek Trail was lush, green, dotted with little blue wildflowers, and overgrown with poison oak and thistle. Dodging the poison oak was to no avail; it was literally everywhere, entwined in trees, poking out all over the trail, everywhere. The trail drops down into some old growth redwoods. Once you reach the creek, you’re about to begin the Peters Creek Loop trail. Peters Creek Loop was a bit of an adventure. The trail was home to a few downed trees. The creek is flowing. The trail crosses the creek twice with no footbridge. There are some stones to step on, but tiptoe carefully; most of the rocks are pretty wet. Trekking poles might help, but I didn’t have any and managed to keep my feet dry. Once you complete the loop, follow the trail back the way you came. I wanted to tack on Tiptoe Falls from Summit Trail as well. Summit Trail crosses the paved road and heads back into the forest to Pescadero Creek. This trail is even less traveled than Bear Creek or Peters Creek. It was covered in downed trees and was difficult to follow. Pescadero Creek water levels were very high. I hiked up and down the bank to find a solid place to cross, but ultimately decided not to get my feet wet and went find food instead. Tiptoe Falls is accessible from other trails close to park headquarters. I imagine it’s gushing quite well right now. Park admission is $10. If the visitor center is open, they accept credit cards. Otherwise, self-register with cash. Campgrounds are closed for maintenance and are scheduled to reopen in June. The backcountry trail camp is open. 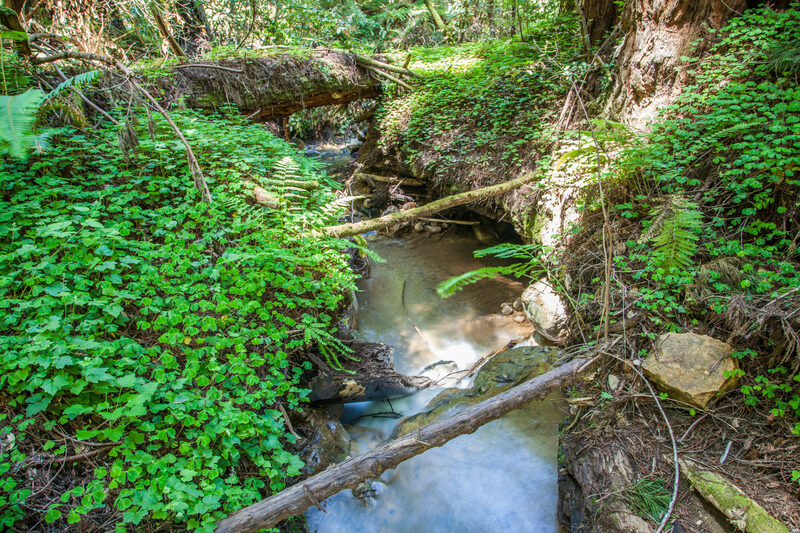 The Bear Creek Trail and Peters Creek Loop are overgrown with poison oak and thistle. Plan accordingly. Mosquitoes are out. Bring bug spray. Portola Redwoods is a “crumb clean” park. Pick up all your garbage—apple cores, orange peels, “biodegradable” trash included—to help protect endangered seabirds that nest within the forest. 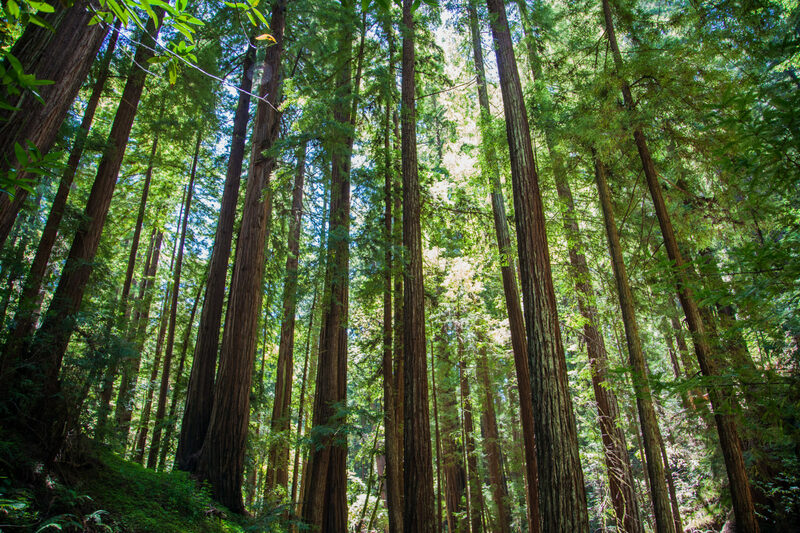 For other amazing redwood hikes, check out my list of best Bay Area redwood hikes. I know what to do when we go to Santa Cruz, thanks. Always great to find new hiking spots.